One of my very first posts was about different baby product rewards programs available to us shoppers of baby stuff. The one I focused on the most was the Pampers Gifts to Grow, as both their diapers and wipes were my favorite (at the time). Now, the diapers are still better than any other I've found, but the "sensitive" wipes are a little too slippy and hard to hold onto compared to the cheap walmart brand "sensitive" wipes I use now. But I digress.. I finally got together enough points and entered them into the Gifts to Grow website to get the item I have been wanting. It is a pack of 6 crayons in the colors of the rainbow. These crayons are special because they are meant to be used to draw on shower walls. 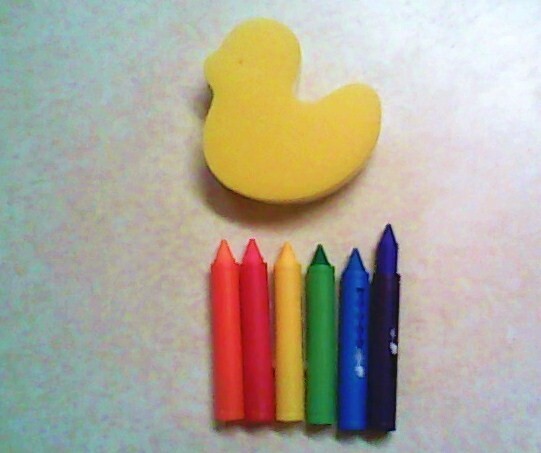 They come with a yellow duck shaped sponge for erasing. They cost 750 points and were shipped free. I received them within 10 days after ordering! Here they are out of the shipping box. As you can see, the actual crayon is inside a plastic holder, like a pen. You move the crayon up by notches with a slider on the side. 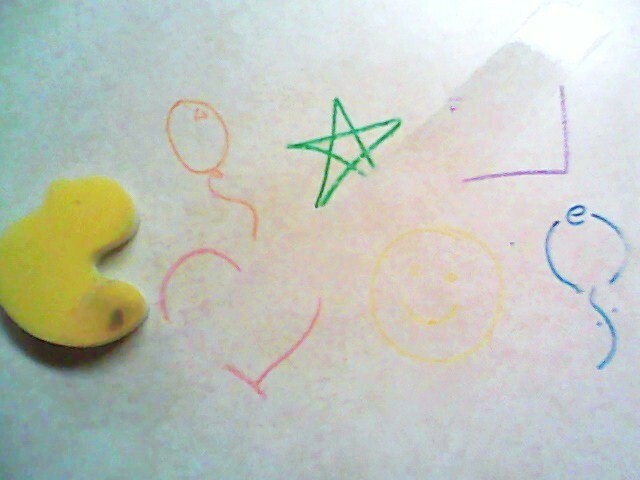 I've raised the purple crayon two notches up. I thought this was a very cost effective Gifts to Grow Reward, as anything worth less points you can get for free elsewhere online, and anything that cost more Gifts to Grow points wasn't worth waiting around trying to save up that many points. This was a nice fun thing I could get for my kids to play with and try out with the relatively low balance of points I had gathered. I hope they continue to have it (they change the gifts a lot). 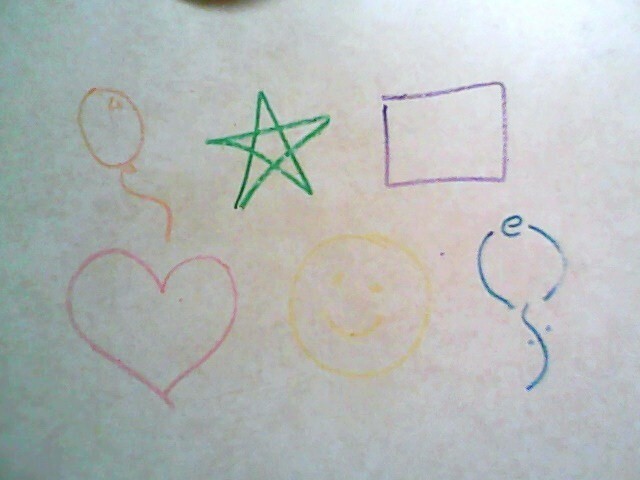 I took a shot of what they look like when I color on my counter with them. And another one of what it looks like after you swipe the wet sponge through a couple times. Yeah, I just wanted to color :) and show off my artwork. 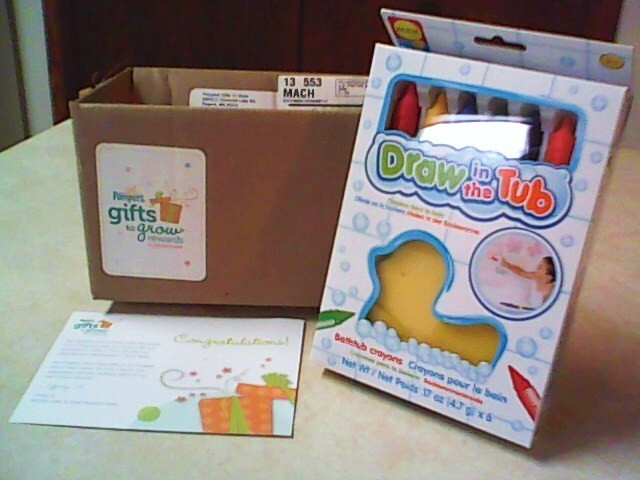 So there it is, I finally got something with my Pampers Gifts to Grow points, and its pretty cool! Very cool! I have to cash mine in too one of these days. I love this program! I know what you mean about those cheep walmart Sensitive wipes. Those were better than any of the more expensive ones!